I've had this CVM fleece for over a year now. It was a bit dry and sorry for itself when I got it (washed a little too harshly I think), so I rejuvenated it by giving it a bath in very (I mean very) hot water with a tbs or so of olive oil dissolved in it with a drop or two of dishwashing liquid. 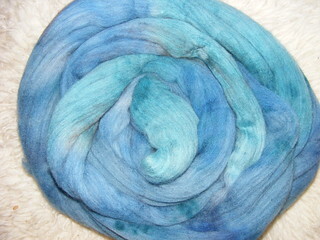 About twenty minutes in this, then a spin and dry, and it was much happier. 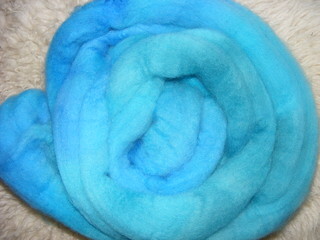 However, still a problematic fleece. Beautiful softness, beautiful crimp, a nice range of colours along the cafe-au-lait theme, but very short and very disorganised. 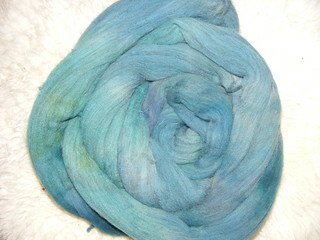 I've combed it bit, but although that makes wonderful yarn there's appalling wastage and really it's too short. I've hand-carded, which would ideally be the best way of dealing with it, but I wasn't feeling the love. So today I got Mark to haul the drumcarder down and had at it. I usually load the drum initially, not by feeding through under the small drum, but by holding the fleece directly to the moving big drum. I find this opens up the fleece nicely, doesn't strain or break the individual fibres at all, and allows me to spread it evenly. This is what it looks like at first. Have to be careful not to load too much; when it's taken off into its first batt, it'll spring up and out. Once the first batt's carefully taken off the drum, I split it in half lengthways and feed that through back on the drum in two halves. This is the subsequent batt on the drum. And this is it off the drum. 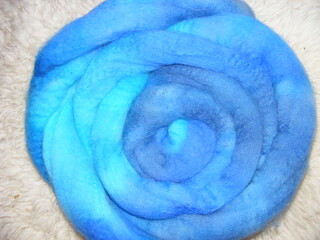 Still a few neps, but nicely fluffed out and ready to spin. 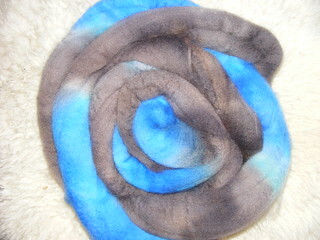 However, there is a subtle range of colours throughout this fleece. You can't really see in this photo, but this pile of batts does have a range of colour between them, and I want it a little more homogenous. So each of these is split into two, and they're fed through on the carder again, using three of the half-batts to make a new batt. This gives me bigger batts and slightly more blended. 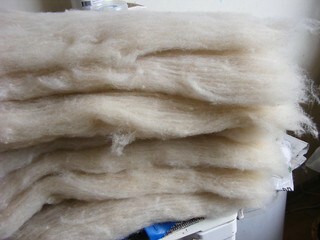 The wool's been through the carder three times if you count the initial loading, and is well opened-up and organised. 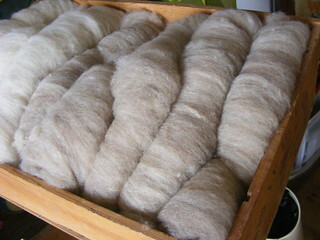 Half the fleece I had remaining in the bag was a slightly darker beige/brown, so that was processed as a different half. 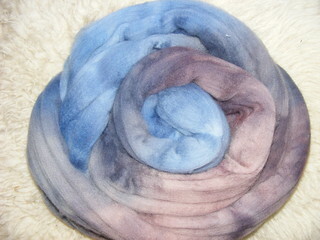 There was much more variation within the two-pass batts for this colourway, so I had to put it through again to even it out. 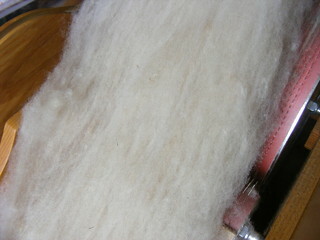 I've ended up with about 500g of carded wool, in a pale warm cream and a darker cafe-au-lait shade. There's about seventeen batts. 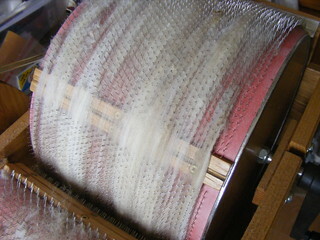 I'm always very wary of over-processing wool through a drumcarder. Past a certain point, even the strongest wool will start to stretch and break and fill the resultant batt with an increasing number of neps and tangles. 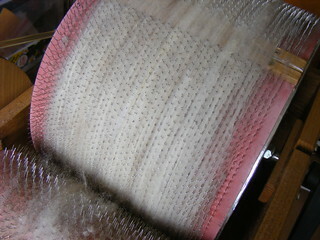 Drumcarders are not a magic tool that will take grotty fleece and instantly turn it into beautiful, fluffy, smooth batts of clean wool; it takes careful washing of fleece and considerate handling of the carder and wool to get anything nice at the end. 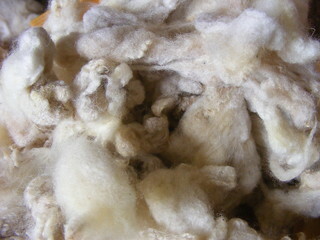 Of course, blending colours and fibres of already-prepared fibre, or commercial tops, is an entirely different story.